The wait is over; Audi’s new A1 Sportback is here, and it’s a looker. Following an extensive teasing campaign, Audi’s sultry, second-gen A1 Sportback has arrived. And by all accounts, it’s adorable. Audi calls it "the ideal companion for an urban lifestyle," and considering it stretches out to just 13.2 feet (4.03 meters) long, 5.7 feet (1.74 meters) wide, and 4.6 feet high (1.4 meters), it’s hard to argue. But don’t let its stout size fool you. Its design draws cues from the Ur-Quattro and Sport Quattro before it; it's no rally car (at least not yet), but its sloped roofline and accenting black roof give it an aggressive look compared to its predecessor. The flat C pillar accentuates the small hatchback's sharp angles, while the optional S Line offers features like larger air intakes, a slim vent below the hoodline, and a larger rear wing. The wheels are sharp too, and come available either in 15-, 16-, or 17-inch options depending on trim. The latter – available either in black or platinum grey – are part of the current range-topping S Line. The new A1 also improved cargo space, up a whole 2.3 cubic feet over the outgoing model, bringing total capacity with the rear sets erect to 11.8 cubic feet. Fold the rear seats down flat, and that number improves to 38.5 cubic feet. Power comes from a host of engines, the entry-level three-cylinder option produces 95 horsepower (75 kilowatts), while the range-topping, turbocharged 1.4-liter four-cylinder produces up to 200 horsepower (147 kilowatts) in its most powerful trim. The three-cylinder engine can be had with either a six-speed manual or an S-tronic dual clutch, while the range-topping turbocharged four can only be had with the S-tronic option. Performance, though, is only part of the equation – the A1 is a tech-heavy hatchback. It’s the latest vehicle to ditch the ancient tablet-style setup and adopt Audi’s new Virtual Cockpit styling instead, similar to the large A8. It comes highlighted by a standard 8.8-inch MMI Touch infotainment system, with top-trim options getting a larger 10.1-inch option; don’t worry, there are still physical dials for HVAC and stereo controls, among others. The A1 also features safety features like lane departure warning, pre-collision warning with automatic emergency braking, and adaptive cruise control. 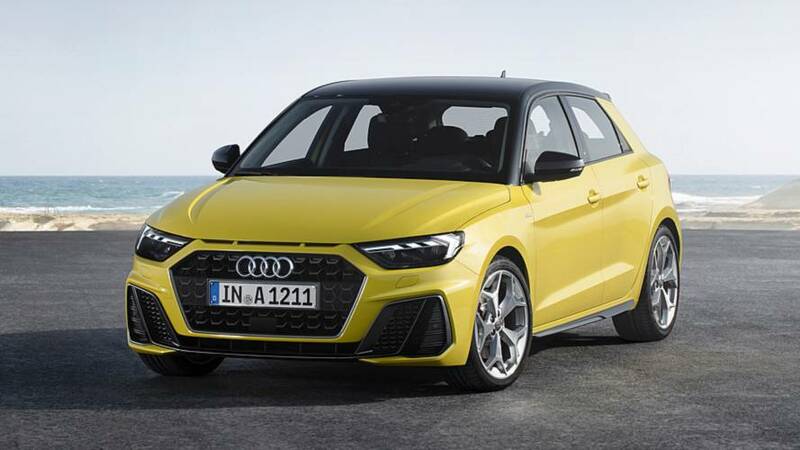 The new Audi A1 will be sold as a 2019 model year vehicle, so expect it to go on sale towards the end of 2018. No word on pricing just yet. In 2010, the A1 made its debut as a brand-new Audi model line. The successful compact is now entering its second generation. The new Audi A1 Sportback is characterized by its dynamic design. It is the ideal companion in the urban environment and is also well suited for longer journeys. With its full-size-worthy infotainment and driver assistance systems, the sporty compact is firmly rooted in the digital world. New trim lines provide ample opportunity for customization. 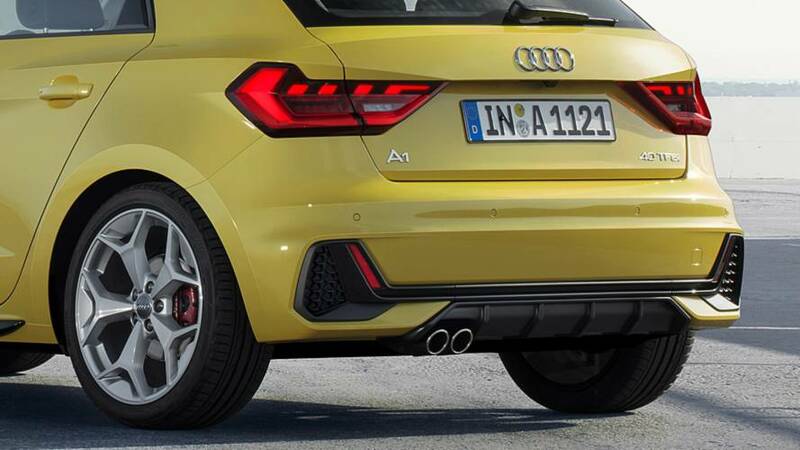 The design of the new Audi A1 Sportback makes it instantly recognizable as a genuine Audi. It has become clearly longer and wider. Its exterior dimensions: 4.03 meters (13.2 ft) in length, 1.74 meters (5.7 ft) wide and just 1.41 meters (4.6 ft) high. The wide track and short overhangs provide for a taut, sporty look. The wide, low-placed Singleframe grille and the implied side air inlets dominate the distinctive front. 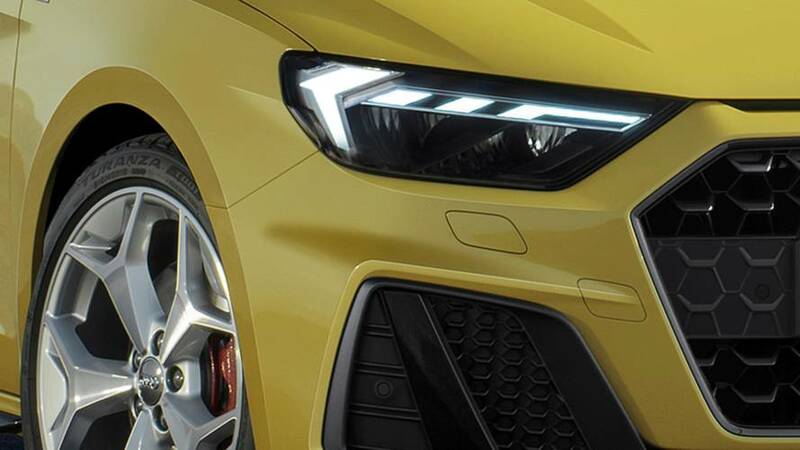 Below the edge of the hood are three flat slits – a homage to the Sport quattro, the brand’s rally icon from 1984. 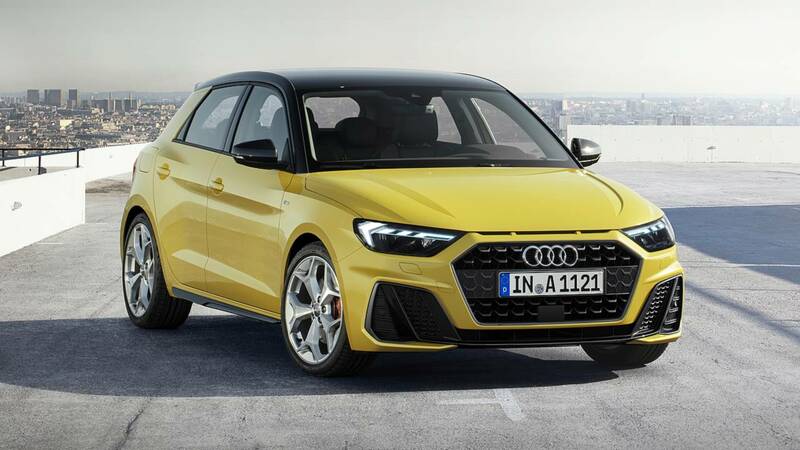 The new A1 Sportback also bears a resemblance to the Audi Ur-quattro and Sport quattro when viewed from the side: the wide, flat sloping C-pillar seems to push the sporty car forward even while standing still. All lines on the flanks, from the window edge to the sill slope upward toward the rear in a wedge shape. The roof dome stretches across the car’s body in a low profile. The distinctively highlighted wheels and the low shoulder line in between give the A1 Sportback a solid stance on the road. With S line equipment, the sporty character has been emphasized even more through numerous features. These include larger air inlets, additional sill trims, an elongated slit below the hood with two webs and the larger rear wing. The top-of-the-line engine is also recognizable with its striking twin tailpipes. The distinctive daytime running light graphics of the optional full-LED lights echo the dynamic wing shapes from sailing, known as hydrofoils. The design of the shutters for the main light functions also draws inspiration from sailing. The hallmark Audi segmentation of the daytime running lights has been interpreted forcefully on the new A1. The wing segments on the flanks create an impression of maximum width. A low-set, concentrated look in conjunction with the small rhombus segments in the top section of the headlights provides a sporty appearance. The dynamic segmentation motif also features in the rear lights to reinforce the instant recognizability of the A1 light graphics. The rear lights are encased in the striking 3D geometry of the lens. The seamless light pattern of the graphics in the dark constitutes a remarkable feature of the two-part rear lights. 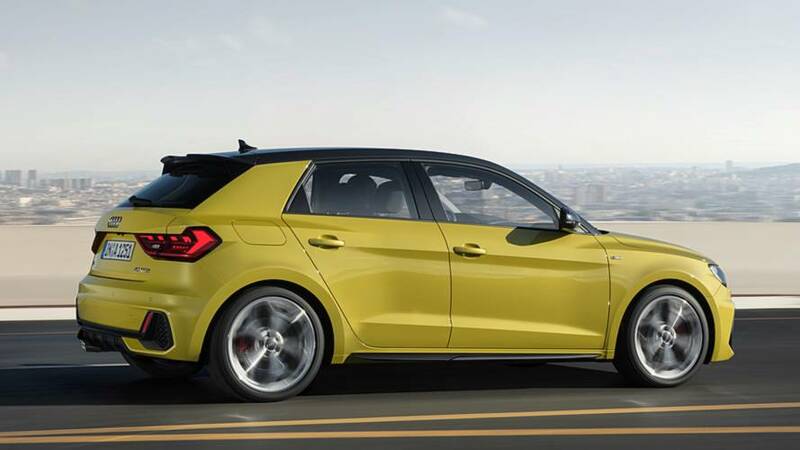 The new A1 Sportback is available in a choice of eleven colors. The roof of the compact model can be optionally finished in a contrasting color from the A-pillar to the roof edge spoiler. The exterior mirror housings, the side front spoiler lips and the side sills are also available in a contrasting color. Audi Sport quattro, the LED headlights and LED rear lights are tinted. The Audi rings in the Singleframe and the model designation on the back are black. Depending on the equipment line – basic, advanced or S line – the attachments – the radiator protective grille, the implied side air inlets, the bottom section of the two bumpers and the diffuser and rear spoiler – are available in various configurations. The black styling package sets additional accents in the interior. A new feature in the A1 Sportback is the modular lines structure, which provides for a particularly high degree of flexibility. For the first time, customers can combine exterior and interior lines however they like. 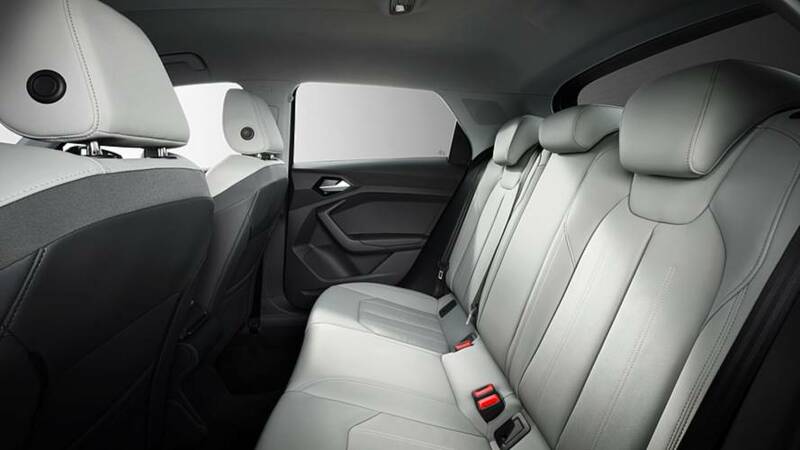 “The sportiest interior in the compact class,” that was the stated aim of the design. The interior is accordingly driver-focused, with its emotive, customizable design. The eye is drawn in particular to the shape of the ventilation nozzles, the digital instrument cluster, and the hood above the instruments. Taut, sporty lines and surfaces characterize the entire interior and feature on the dashboard, as well as in the doors and the center console. The center console and the optional MMI touch display are inclined toward the driver at a 13-degree angle. The display and the air vent strip on the front passenger side are integrated into an area with its black-panel look, which stretches through into the doors. The three interior lines “advanced,” “design selection” and “S line” offer numerous opportunities to choose colors and materials to reflect the customer’s individual taste. The design of the trim strip on the dashboard in front of the front passenger varies according to the equipment line – with coordinated color accents on air vents, center console and the door handle recesses. The optional contour and ambient lighting package brings the interior design to life in the dark with LED light elements providing 30 selectable colors. The new A1 Sportback is much more spacious – making life much more comfortable for the driver, front passenger and rear passengers. Luggage capacity has increased by 65 liters (2.3 cu ft). Normal capacity is 335 liters (11.8 cu ft); with the rear seats folded down, this increases to 1,090 liters (38.5 cu ft). Loading sill height is a comfortably low 67 centimeters (26.4 in). Because the springs and dampers are installed separately, the compartment between the wheel arches is exactly one meter (3.3 ft) wide. The new Audi A1 Sportback is fit for the digital future. Even the basic version comes standard with an all-digital instrument cluster with a high-resolution, 10.25-inch display and a multifunction steering wheel. The optional Audi virtual cockpit presents comprehensive and diverse information directly in the driver’s field of view, from navigation arrows to the dynamic animation of the navigation map and infotainment content (including Audi connect services) to the graphics of some of the driver assistance systems. The operating philosophy takes its cue from the infotainment concept in the full-size segment. The new A1 Sportback comes standard with the MMI radio, which is controlled via the multifunction buttons on the steering wheel and the display in the digital instrument cluster. Even the basic radio includes a Bluetooth interface. With the MMI radio plus, the cockpit gains an 8.8-inch MMI touchscreen that integrates seamlessly into the black-panel look. As with a smartphone, all commands are via touch input. Like its big brother the Audi A8, the new MMI touch operating concept also recognizes handwriting input with a finger trail without having to stop and wait for individual letters. In the top configuration, MMI navigation plus offers a 10.1-inch MMI touchscreen. With an active data connection, up to four free map updates per year are automatically downloaded and installed. They can also be updated manually by SD card after downloading them from myAudi. The latest generation of voice control further improves the dialog between driver and car. In conjunction with Audi connect, MMI navigation plus offers A1 Sportback drivers functions from the full-size segment such as hybrid route guidance, which calculates the route in the cloud, taking into account the entire traffic situation. Hybrid destination entry – a combination of onboard and online search – helps customers to find gas stations, parking lots, restaurants or hotels. It downloads information such as fuel prices, parking space availability or Yelp customer reviews and displays it directly in the destination pick list. Alternatively there is the option of a Google search. Additional highlights are the satellite map view and the new 3D city models, which offer a precise map view of many urban centers. With MMI navigation plus, customers can also use the versatile online services from Audi connect. They provide such things as travel, parking and traffic information, access to Twitter and your email inbox, and enable navigation with Google Earth and Google Street View. Drivers can also call up weather information and fuel prices. The connectivity package ensures you are always well connected on board the new A1 Sportback. It includes the Audi smartphone interface, which uses Apple CarPlay and Android Auto to integrate iOS and Android smartphones into an environment in the MMI programmed specifically for them, and also two USB interfaces (1x USB-A, 1x USB-C with increased charging current). Another option, the Audi phone box, connects the smartphone to the vehicle antenna for improved reception quality with LTE technology and charges the smartphone inductively via wireless charging according to the Qi standard. Further optional modules round off the infotainment lineup. These include DAB reception and the “hybrid radio” function, which automatically and with no noticeable interruption switches from terrestrial radio (FM/DAB) to an online stream if reception is poor. The function allows customers to access more than 25,000 different stations and podcasts from around the globe. The optional Audi sound system features eight loudspeakers, including a subwoofer and a six-channel amplifier producing 180 watts. Customers can also choose the Bang & Olufsen Premium Sound System with 11 loudspeakers and 560 watts. Its 3D effect, with the windshield used as a reflecting surface for the four loudspeakers in the dashboard, delivers an extraordinary listening experience that is unrivaled in the segment. The additional layer of sound generated at head level by special algorithms really opens up the space acoustically. The driver assistance systems for the Audi A1 Sportback come from the full-size segment. They keep the new A1 Sportback the right distance from the car ahead, making it easier for the driver to stay in lane and to park the vehicle. The standard lane departure warning helps the driver to keep the car in its lane. At speeds of 65 km/h (40.4 mph) and above, the system uses a camera to detect the lane markings and uses corrective steering interventions and warning vibrations to keep the car in its lane. Also standard is the speed limiter, which reliably prevents the A1 Sportback from exceeding a selected maximum speed. Another standard feature is Audi pre sense front. The A1 Sportback sets the standard in its segment with this system. The radar sensor recognizes critical situations involving other vehicles, crossing pedestrians or cyclists ahead of the vehicle, even when visibility is poor such as in fog. If Audi pre sense front identifies a pending collision, it warns the driver according to a graduated concept. If there is no reaction following a visual and acoustic warning, the system initiates a short jolt of the brakes. If the situation remains critical, the car decelerates automatically depending on the situation and surroundings, and brakes the vehicle to a standstill at low speeds. Depending on the conditions, the A1 Sportback can thus avoid a collision entirely or mitigate its severity by reducing the impact velocity. If necessary, the protective measures of the optional Audi pre sense basic are initiated. The front seat belts are electrically tensioned, the windows are closed and the hazard warning lights are switched on. Adaptive speed assist also uses radar. It keeps the Audi A1 Sportback at the desired distance from the vehicle ahead. The driver can set the distance in five steps and adjust acceleration using the modes in Audi drive select. If the vehicle is equipped with S tronic, the system covers a speed range of 0 to 200 km/h (124.3 mph); with the manual transmission, the range begins at 30 km/h (18.6 mph). In normal traffic, the Stop&Go function works together with the S tronic to bring the Audi A1 Sportback to a complete stop behind the vehicle ahead. The system remains active if the driver presses the brake after the vehicle has come to a complete stop. Otherwise it shuts off after approximately three seconds. The new Audi A1 Sportback offers various systems to make parking easier. For the first time there is a reversing camera in addition to the rear parking system. The camera is connected to the parking system plus, which also detects objects in front of the car and warns the driver of them acoustically and visually. Park assist can steer the A1 Sportback into parking spaces. While driving at slow speeds, two ultrasonic sensors detect suitable parallel or transverse parking spots. The driver just has to engage the right gear, use the accelerator and the brakes. Park assist backs the new compact into the spot. With the new version of the park assist, the A1 Sportback can also pull forwards into perpendicular parking spaces, maneuvering multiple times if necessary. The system also exits parallel parking spaces. The body of the new Audi A1 Sportback includes components made out of hot-formed steel that form the backbone of the passenger cell. The ultra-high-strength composite comprises 27 percent of the bodyshell, providing for supreme passive safety and high torsional rigidity. The rigid body and uncompromising build quality guarantee sportily precise driving and the absence of intrusive noise on board. With a front area of 2.07 m2 (22.3 ft2) and a drag coefficient of 0.31, the new A1 Sportback cuts effortlessly through the wind. On the body, details such as the aero triangles on the roof edge spoiler and the sculpted rear lights provide a defined flow separation. The underfloor is largely covered with paneling. 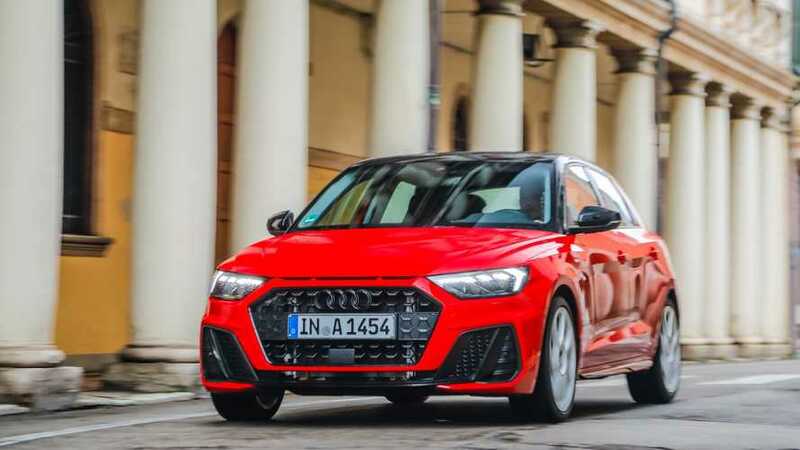 Whether running around town or going on a weekend excursion – its powerful engines in particular make driving the new Audi A1 Sportback so much fun. There is a choice of efficient TFSI engines with outputs ranging from 70 kW (95 hp) to 147 kW (200 hp). The right engine is available whatever the requirements – in accordance with the Audi rightsizing philosophy. The basic engine is a small-displacement (one liter), three-cylinder unit, whereas the top engines are four-cylinder units displacing 1.5 or two liters. Turbocharging, direct injection and a particle filter are standard. Audi offers a manual transmission or the S tronic dual-clutch transmission with seven speeds in combination with all engines. The exception is the 40 TFSI, where a six-speed S tronic transmission shifts gear as standard. The axle design of the new Audi A1 Sportback delivers agile handling and a sporty, poised driving experience. The front suspension is a McPherson construction with lower wishbones and cast aluminum pivot bearings. The A1 Sportback is equipped up front with coil springs and telescopic gas-filled shock absorbers. A compact, lightweight torsion beam axle with integrated stabilizer is used in the rear. Audi offers three different suspension configurations for the new A1 Sportback. Besides the basic suspension, there is an option for a tauter sport suspension. The addition of adjustable shock absorbers upgrades the sport suspension to the top-of-the-line suspension. In combination with the speed-dependent, electromechanical power steering, it delivers precise straight-line tracking and safe, neutral cornering behavior. Two dynamic packages combine equipment options to give the A1 Sportback an even sportier trim. These include the sport suspension, red brake calipers and larger brake discs. The “Performance” dynamic package also includes adjustable shock absorbers, Audi drive select and a sound actuator. The new A1 Sportback rolls off the production line with the Audi drive select dynamic handling system as an option. With it, drivers can select from four modes that influence the driving characteristics: auto, dynamic, efficiency and individual. In the base configuration, Audi drive select affects the power steering and the engine characteristics. Optional components, such as the S tronic, adaptive cruise control with Stop&Go function, cruise control, start-stop system, engine sound and the suspension with adjustable dampers are also connected to the dynamic handling system. The brakes of the new A1 Sportback can be precisely metered and provide a responsive, taut pedal feel. The vented front discs measure 276 millimeters (10.9 in) in diameter; the rear discs 230 millimeters (9.1 in). The latter are standard from the engine variant with 85 kW and above. With the optional dynamic package, the discs measure 312 mm (12.3 in) up front and 272 mm (10.7 in) in the rear. Another option available in the A1 Sportback is the hold assist, which enhances safety by preventing the car from rolling after stopping on uphill or downhill slopes. Audi offers a broad range of wheels for the new A1 Sportback. Depending the engine variant, 15, 16 or 17-inch wheels are standard. Alloy wheels in four sizes from 15 to 18 inches, including a 17-inch wheel with black or platinum gray inserts are available as options or as part of the “advanced” and “S line” equipment packages.